European champions Real Madrid have handed Santiago Solari a contract as first team coach through to June 2021, the club announced in a statement on Tuesday. The 42-year-old Argentine has led the team to four wins in four games since taking over as interim manager in place of sacked former Spain coach Julen Lopetegui two weeks ago. 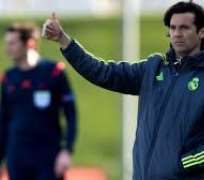 Solari has enjoyed the best start of any coach in the club's history and his appointment as permanent manager was approved by the Spanish soccer federation (RFEF) on Monday. He played for Real from 2000 to 2005 in the Galacticos era alongside Zinedine Zidane. The former France captain became the club's coach and won three UEFA Champions League titles in a row before stepping down. Solari led Real's reserve team from 2016 until he took over from Lopetegui last month. This was after the club's poor run of form culminated in a painful 5-1 El Clasico defeat by FC Barcelona. He has presided over victories against Melilla in the Copa del Rey, Viktoria Plzen in the UEFA Champions League plus Real Valladolid and Celta Vigo in La Liga. Lopetegui was sacked after Madrid sank to ninth in the domestic standings.